Typically, when Rick is on the road researching or filming, I’m either on the road with a tour group or guidebook researching in Europe, or I’m subbing at a private school near our home town. I’m sure most people can imagine that it’s hard to be apart from one’s partner for a two-month stretch, so when our paths can cross, we try to take advantage of it. 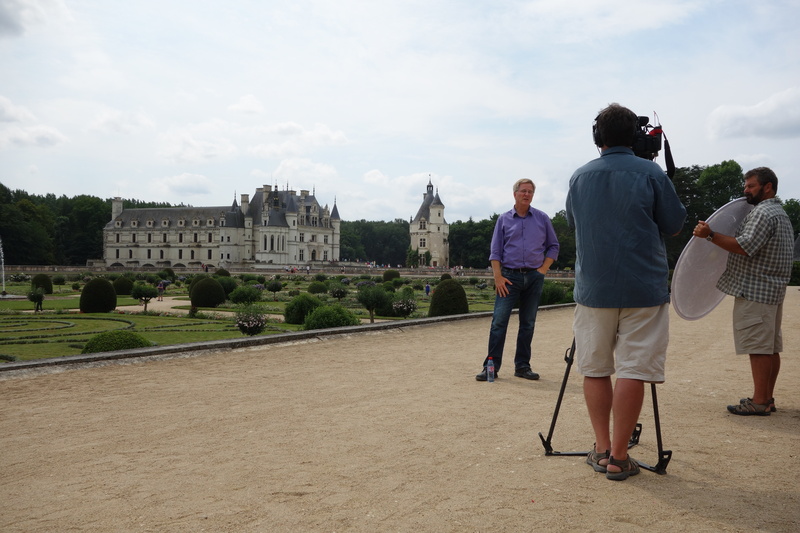 Late this summer, I joined Rick, his producer Simon, his cameraman Peter, and his France guidebooks co-author Steve S. for their last day of filming in the Loire Valley. 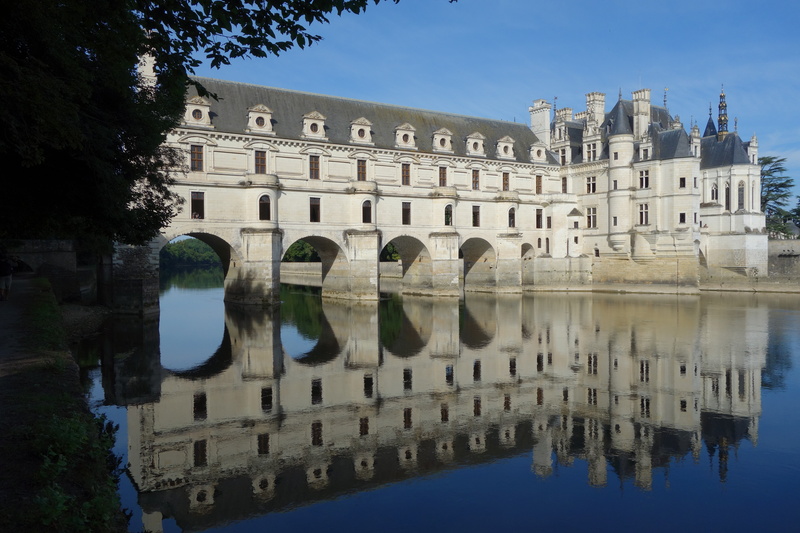 We had an early start at Château Chenonceau, also known as Le château des dames or the Castle of the Ladies. It’s one of the most beautiful and oft-visited castles in the Loire Valley, and over the centuries, has been lovingly cared for by the likes of the mistress of Henri II (Diane de Poitiers), Henri II’s wife–Catherine de Medici, Madame Louise Dupin (George Sand’s grandmother), and has been owned by the chocolate-making Menier family since 1951. With a TV crew, lines aren’t a problem. I’m not gonna lie. Being with a TV film crew has its perks, including driving right onto the property, not having to worry about lines, and fresh coffee and croissants in the château manager’s office. But the work that goes into filming what will end up being a 5-minute segment of a 30-minute show is impressively demanding. And considering that the crew is essentially only three people, it’s amazing how everything that needs to get done gets done…and done really well. 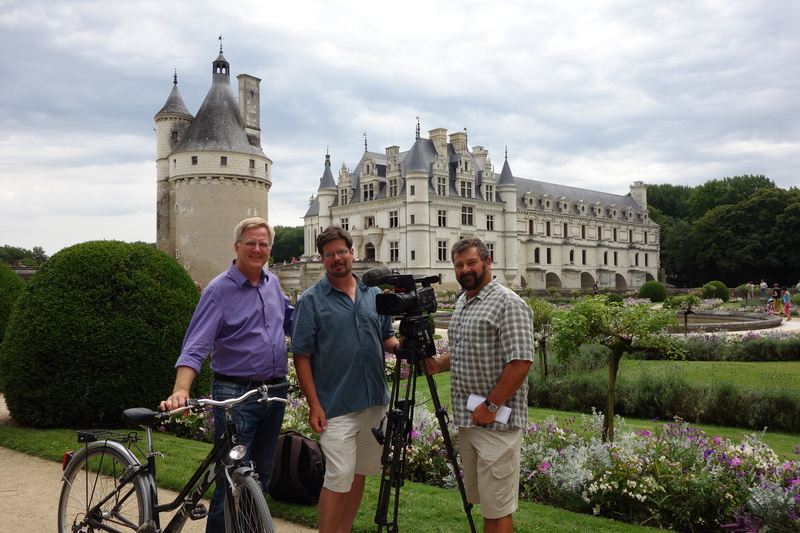 This tireless team of three consistently make great travel TV. Killing some time taking selfies while Peter shoots exteriors of the château. While Rick and Simon scout the interior, I accompany Peter to get exterior shots of the château and the Cher River, which it straddles. He shoots from the exterior courtyard, from one of the gardens, and from the opposite riverbank. Pan left, pan right, pan up, pan down, hold, wide to tight, tight to wide, and every possible variation of shot is done–all so that Simon and the editor back home (Steve C.) can have a variety of options to make the show look amazing. Peter gets some b-roll of a painting of Henri IV’s mistresses as The Three Graces. Once inside, Rick wants to get key rooms filmed. Sometimes that just means getting b-roll (supplemental footage that sets the scene) of the decor, and sometimes people need to populate the scene. Innocent bystanders end up as “Rick Steves’ Best of Europe” extras, and every now and again, eager fanatical fans toting their Rick Steves’ guidebook or his Audio Europe app get their 15 milliseconds of fame. My mom will be thrilled to know that I made it into one scene, intently admiring paintings, cabinets, and a bed once used by some royal or another. Hopefully I stay off the cutting room floor. Rick takes a break from the on-camera to sign a guidebook for faithful fans. The “on-cameras” can be tough. This is when they film Rick doing a monologue that sets up historical or cultural context. Memorizing and delivering his lines (concise yet poetic as they may be) is tricky enough, but other uncontrollable factors can make this process go on and on. You might hear someone sneeze, people stop and stare into the camera, others don’t see the camera and walk right in front of the shot or ask Rick to sign their book, a bird flies in through a window and freaks people out, whatever. But the crew takes everything in stride. Finally after take 22, the team is confident that they’ve got what they need for “beautiful television”. Rick reviews the last few takes. 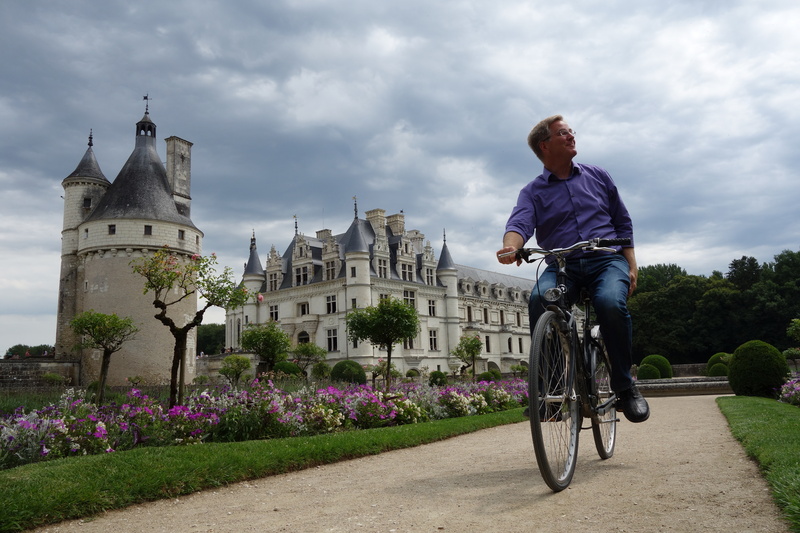 Biking his way through Catherine de Medici’s garden at Chenonceau, Rick nails the “teaser”. Back outside, it’s “teaser” time. At the top of every show, Rick gives little hints about the places he’s visiting in that episode, saying things like, “Hi, I’m Rick Steves, back with more of ‘The Best of Europe’. This time we’re exploring French royal homes and luscious landscapes. It’s the Châteaux of the Loire Valley. Thanks for joining us!” You might see him standing in front of an iconic monument, paddling a canoe, or perhaps sheering a sheep. This time, he went biking through the Chenonceau gardens and did it without crashing into tourists. We were all impressed. Finishing the day and starting our vacation with a simple French picnic dinner at Château de Pray. 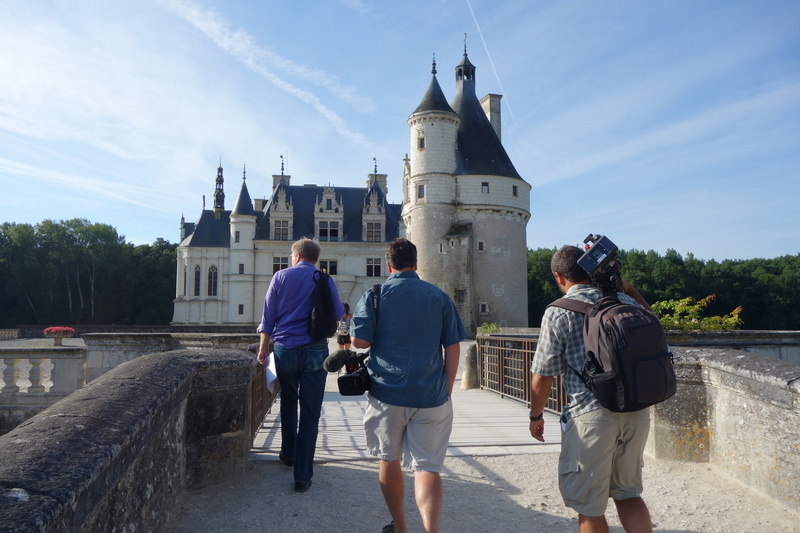 After a few more on-cameras, we called it a day and headed back to our nearby home for the night–the Château de Pray. 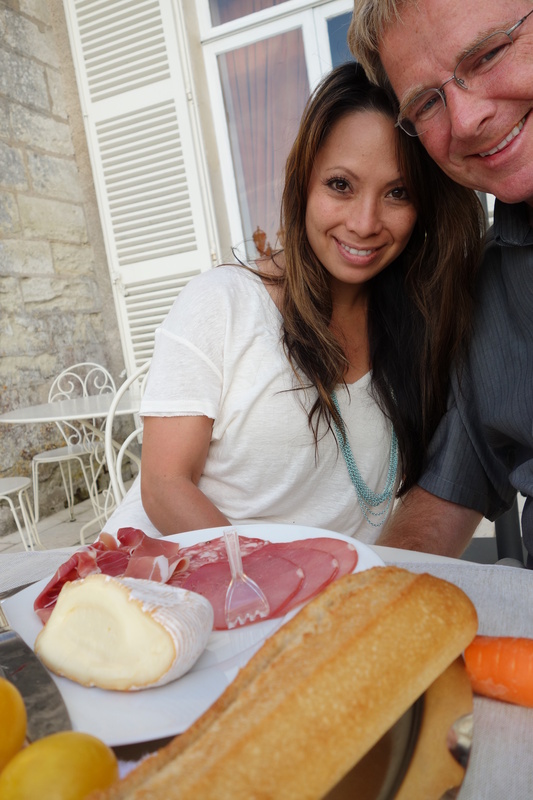 A simple picnic dinner of local cheese, cured meats, fresh bread, and ripe vegetables, along with an glorious sunset view of the French countryside was the perfect way to end a long day of great TV filming and to start our mini-vacation. 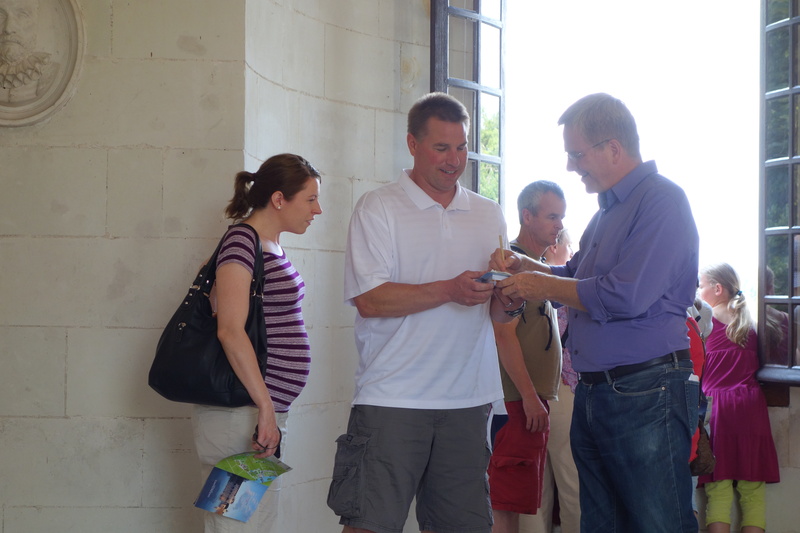 All of us avid Rick Steves fans are very envious of your perpetual backstage pass! I’d just like to mention that a new friend of mine told me his story of meeting Rick Steves while on vacation. He was blown away by how nice he was in person and how he took the time to talk to my friend and his fellow travelers, which he did not have to do. It’s so great to learn a celebrity really is a good person in real life too! 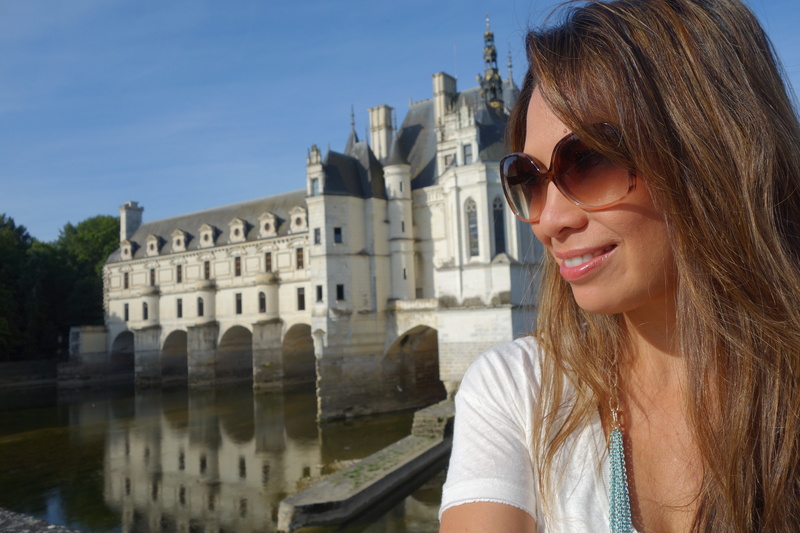 One day I will get back to the Loire Valley to visit Chenonceau. It’s been on my must see list for a while now. Don’t be hard on “eager fanatical” fans, Rick is a fantastic for his work and that is what makes his company so popular, but where would he be without us! My kids were delighted to meet him in person after we had bought them all his books and DVD for their second trip to Europe. Hi, Judy! No harm intended. Rick is so grateful to everyone who uses his resources to make their trips magical and is always happy to bump into them when he’s on the road. It continues to amaze me that he has turned his passion into a career and that his work makes countless people happy, better educated, and better citizens of the world. And when self-proclaimed “Rick-nicks” get to be in the TV show, you should really see just how happy they are. As a teacher and as a travel advocate, I’m so glad you are opening the world up to your children and that they and you got the chance to meet up with Rick. Glad to hear from you, I have been enjoying your website too, you are doing a great job! We have Back Door fans for over a decade, I don’t think we would have traveled this much without all the books, advice and DVD’s! We would like to see more “out-takes” or bloopers! Thanks for this insight of filming, very entertaining & educational! I am sure you didn’t mean to be hard on the eager fanatical fans, I am one of them! You are one luck lady to get to hang out with “The Energizer Bunny of Travel”. I can’t believe how Rick keeps up his fast pace. I’ve been a Rick-nick since the early days when he mailed his newsletters and sold VCR tapes of his picture shows. In his darkened garage he would project his slides onto a screen and narrate the descriptions just like he was talking to friends over for a beer. I first met Rick about 15 years ago in Tampa and had a short chat as he signed my RS guidebook of Italy. I said thanks to him my three European Adventures were full of interesting experiences. Then about 3 years ago we got to talk several times before and after his lecture (again at WEDU). Since we look alike he called me his “Doppelganger” which is the greatest compliment ever! I wonder how long it will be before this is aired. It sounds like a very interesting and beautiful episode. I think Fall 2014 is when those episodes will air. If not, it’s on the longer cycle, which will mean Fall 2015. 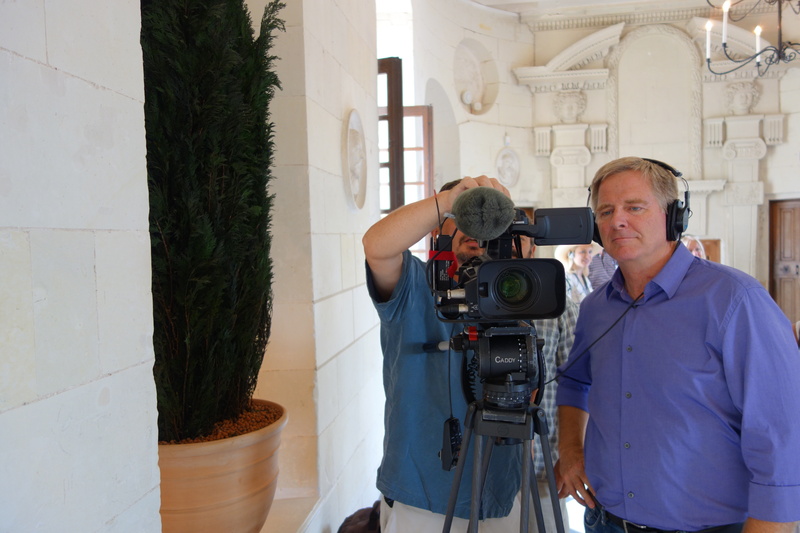 And don’t forget, all his shows on now on the relaunched http://www.ricksteves.com website. Thanks. I didn’t know about the shows being online. Great.